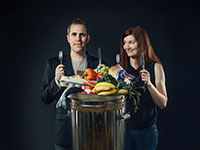 "Powerful...Just Eat It delivers the real story about food waste in the developed world. This film will change your perspective; it will encourage you to waste less food; it might inspire you to join the movement to fix our food system." "An enjoyable film. Just Eat It uses both everyday people and respected experts to create a personal look at the problem of food waste in industrialized societies. The problems and insights of the narrators personify the problem and create an accessible entry point for discussions about solving the enormous problem of food waste in our society." "Offering real food for thought in a hungry world, this engaging and information film is highly recommended." "Just Eat It explores the personal implications of a global environmental issue. The filmmaker's quest to live on food that would have been wasted is filled with moments that are authentic, challenging, and enlightening. This film is an excellent educational resource, and a wonderful conversation starter for those concerned about food waste and food security." "Highly Recommended...School, public and college libraries will benefit by including Just Eat It in their collections, particularly for those populations concerned with the efficient application of resources." "Hugely entertaining...Will leave audiences gobsmacked...Baldwin and Rustemeyer have drawn attention to an important, overlooked issue, and taught by example that a difference can be made, simply by tweaking rather than revolutionizing one's lifestyle." "Just Eat It presents a compelling glimpse into the scale of the food waste problem in North America. While there are many contributors to the problem, the clear message is that personal choices are at the heart of the issue. The film shows that the food system cannot become a better steward of Earth's resources until we ask hard questions about consumption in our modern society." "This film explains this important issue in a clear and teachable way. It's a great educational tool." "Includes interesting information on buyer trends such as our tendency to make aesthetic purchases and our culture of abundance...Would serve well as a catalyst for a related inquiry project on topics related to sustainability, local food waste statistics, and so forth." "Just Eat It is an entertaining (and sometimes horrifying) way to learn about the issue of wasted food. The film could be used to spark discussion in communities and in classrooms across a wide range of levels. For example, I'm hoping to host a screening and discussion here for our graduate students. And at the same time, my 10 year old walked by while I was watching it and got so interested he ended up staying." "A well-written and well-produced documentary." "Offers unsettling statistics--for example, the water required to produce one hamburger is the equivalent of a 90-minute shower--along with striking visuals--a field full of wasted celery stalks, a dumpster filled to the brim with containers of not-yet-expired hummus. After watching, you might just rethink going out to eat while those leftovers sit in the fridge another day." "Food Waste is one of the greatest problems in our food system today, from the farm to grocery store to the bulging refrigerator. This film combines expert testimony with the story of a young couple seeking their own solutions. At the very least, it will make you want to buy ugly fruit." "Just Eat It is funny, thought provoking, and is bound the steer the ship in the next wave of environmental consciousness, one best-before date at a time"
"Just Eat It raises awareness of a significant environmental issue and examines what food waste looks like from a global perspective...Viewers will come to understand the tremendous amount of food that is wasted in our society, why there is such waste, how this food waste impacts society, and methods that can be used to reduce and reuse waste."